The book ‘The Comic Natural History of the Human Race,’ by H.L. 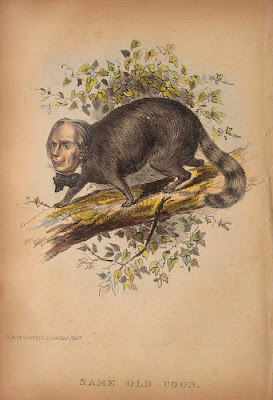 Stephens, has a double distinction: it is the first book of caricatures by an American published in the United States. 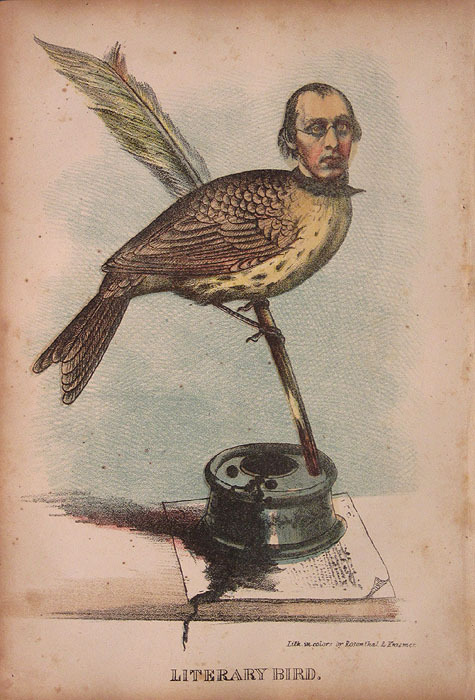 It is also the first book to feature chromolithographs published in the United States. Henry Louis Stephens (1824-82) was born in Philadelphia into an artistic family. 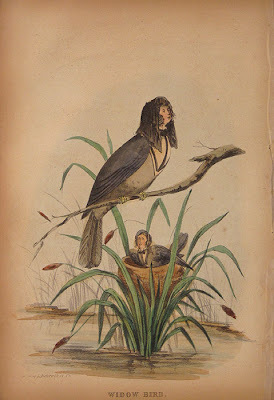 He aspired to become an artist at an early age and contributed to the Philadelphia humor magazine, The John-Donkey (1848). The second volume of The John-Donkey was published by Samuel Robinson, a lithographer and publisher. 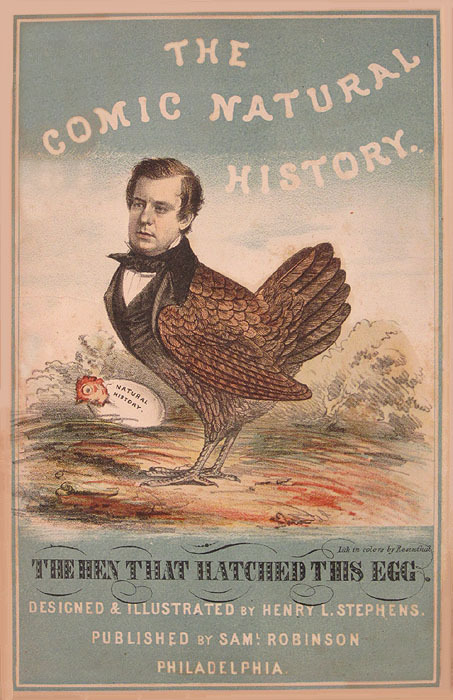 He had already published Stephens’ first effort, an amusing little pamphlet entitled ‘Little Billy Vidkins or the Lives of the Poets’ (January 1848), that some comic historians claim is the first comic book created by an American. In 1850, Stephens, undoubtedly inspired by fellow Pennsylvanian John James Audubon’s monumental portfolio of bird drawings, approached Robinson with the idea of producing a satiric take on natural history tomes that would feature caricatures and ‘learned’ essay on celebrities and comic types of the day depicted as animals and insects. Initially, the book was published in monthly parts, from February through September 1851, for 50 cents a part. Each part sported a bright chromolithographic wrapper and five chromolithographic plates and essays inside. As Whitman Bennett in his ‘A Practical Guide to American 19th Century Color Plate Books’ (1949) has observed, the eye-catching product must have certainly caused a stir. After all the parts were issued, Robinson gathered them in book form and published a colored and an uncolored edition. C.W. Webber’s ‘The Hunter Naturalist’ (1851) is commonly referred to as the first book published in the U.S. featuring chromolithographic plates. Why scholars have overlooked Stephens’ ‘Comic Natural History’ is a mystery. 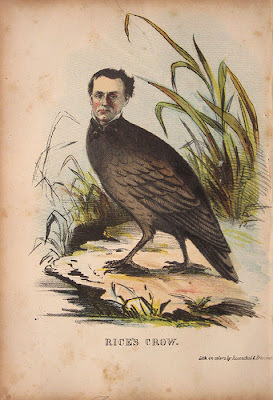 True, Webber’s book was published in September of 1851, while Stephens’ effort was not gathered together and issued as a book until the following month, but all of the chromolithographic plates for Stephens’ work were before the public prior to that and properly fulfill the definition of having been published first. Interestingly, Robinson was responsible for the color plates for both works. 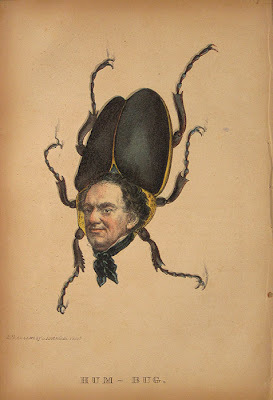 The purist might argue that what Stephens produced should not be classified as caricatures since the portraits of the celebrities are devoid of exaggeration, that is, are realistically drawn, and the humor derives entirely from the fact that these portraits are appended to the incongruous bodies of animals and insects. 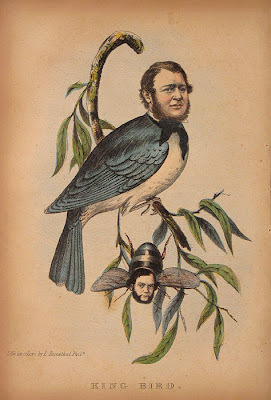 On the other hand, the portraits of comic types that are interspersed with the celebrities are caricatures, albeit rather crude ones and not as aesthetically pleasing as the celebrity portraits. With the help of checklists drawn up decades ago by past librarians at the American Antiquarian Society (Worcester, MA) and the Library Company (Philadelphia), I append my checklist of the plates in Stephens’ ‘Comic Natural History of the Human Race.’ The first name refers to the title given to the essay, the second in parentheses refers to the title on the plate when it varies from the essay title, and the third refers to the personality depicted. Some authorities identify this plate as Jenny Lind but the essay doesn’t support it. Robert W.G. Vail (AAS librarian, 1932) identified this plate as John Woodside, the father, but it is surely Abraham Woodside, the son, who was Stephens’ contemporary. Vail suggested that this plate was a type, but the Russell attribution seems correct. Some authorities suggest that this plate is Jenny Lind but neither the caricature nor the essay support it. Vail suggested that the Catamaran was a type, but the Cushman attribution seems correct.